Dr. Bradbury is a group leader in the Bioscience Division of the Los Alamos National Laboratory. He is a leading expert on antibody engineering and phage display technology. He was a founder and first President of the Antibody Society and serves on its board. He has helped organize over forty international congresses and practical courses in this field. He has published over 130 peer reviewed articles, including reviews and commentaries in Nature, Nature Biotechnology, Trends in Biotechnology, Methods in Molecular Biology and other top scientific journals. His present research interests lie in improving present phage display technology as well as developing applications related to the human proteome project. Dr. Bradbury was trained in medicine at the universities of Oxford and London. He received his Ph.D. (Cambridge University) in the MRC Laboratory of Molecular Biology under the guidance of Nobel laureate, Dr. Cesar Milstein. 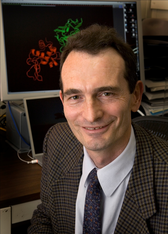 Dr. Waldo is a renowned expert in structural genomics, protein folding and folding reporters (using GFP). Known as 'The GFP Guy', he was invited to the 2008 Nobel ceremony when Shimomura, Chalfie and Tsien won on GFP. He and his team at the bioscience division at Los Alamos National Laboratories have engineered a collection of improvements on GFP, creating vast possibilities for monitoring the folding, movement, solubility and interactions of proteins and peptides and performing structural genomics in a high throughput manner. His team also devised broadly useful screening and evolution methods to increase protein stability. These technologies have made it possible for researchers to screen through millions of cells in a few hours to find useful proteins for targets for drug design. They are now being used throughout the world to study not only the structures of proteins, but everything from the behavior of thermophiles to how neurons interact. Dr. Waldo received his PhD degree in chemistry from the University of Michigan, Ann Arbor. He was an NIH postdoctoral fellow at the University of North Carolina. He joined Los Alamos National Lab as a Directors funded postdoc. He received the prestigious Los Alamos Fellows Prize for Research in 2010 . Dr. White is the James and Karen Frank Family Professor in Human Genetics, Professor of Ecology and Evolution, and Director of the Institute for Genomics &amp; Systems Biology at The University of Chicago and Argonne National Laboratory. He is a world leading expert in cancer genomics and systems biology, and a pioneer in combining experimental and computational techniques to understand the coordinated action of networks of genes that control developmental, disease and evolutionary processes. He was among the first to design genome-scale experiments and apply them to the big questions in genetics and evolution. His team has made significant contributions to the ENCODE, modENCODE, NIH GTEx and psychENCODE projects.&nbsp;He has over one hundred publications in top journals such as Nature, Science and Cell. Dr. White completed his Ph.D. at Standard University followed by a postdoctoral fellowship at Stanford Genome Technology Center. He was named an NIH Genome Scholar, a W.M. Keck Distinguished Young Investigator in Medical Sciences,&nbsp;an Arnold and Mabel Beckman Young Investigator and a Helen Hay Whitney Foundation fellow. He serves on the Scientific Advisory Boards of a number of government agencies including the National Cancer Institute (NCI) and private corporations. Dr. Tian is a pioneer in chip-based gene synthesis technology, who has led the effort of developing the world’s first high-throughput on-chip gene synthesizer. This technology has opened the door for large scale and economical gene and genome synthesis and its numerous applications, and is ushering synthetic biology and biotechnology into a new era. His team has also developed methods that allow determination of a protein’s true expression potential in a given expression system and design of genes with optimal expression level in a genetic system. Dr. Tian received his PhD degree from Stony Brook University, followed by a Life Science Research Foundation (LSRF) postdoctoral fellowship at Harvard Medical School. He was appointed Assistant Professor of Biomedical Engineering and Genome Sciences at Duke University and then Professor and Director of Synthetic Genomics Laboratory at the Chinese Academy of Sciences. He was named an Arnold and Mabel Beckman Young Investigator and received a Hartwell Foundation Individual Biomedical Research Award. His research was published in Nature, Nature Biotechnology, Trends in Biotechnology and other top academic journals. He is the founder and president of General Biosystems, Inc. and chairman of the Scientific Advisory Board.